After seeing countless friends post photos of their delicious meals at The Bistro, I decided that my time to try this photogenic food on my last visit to the island with my mom. i suggest making a reservation and arriving early because the restaurant shares a parking lot with Topsail classic, Max's Pizza. Our reservation was at 7:45PM on a Friday night and the place was poppin'! When we walking in, we were promptly seated just by the window which overlooks the sound. Holy heck, is it beautiful out there y'all! Highly suggest asking for a patio or window seat because the view is great. I told my mom that it looks like where someone would get engaged! After taking approx 900 photos of the view, I finally met my mom back at the table to decide what we would order. In true Jackson family fashion, we zeroed in on the Baked Pimento Cheese Dip! This "small plate" comes in a mini-skillet with a side of house made chips. It was freaking DELICIOUS! My mom and I both agreed that we would be back, if our full meal only consisted of this yummy dish. When the chef heard that it was our first time at the restaurant even though we have been homeowners on the island for two decades, he sent over two additional small plates. First up was the Black River Farms Charred Baby Carrots (which were absolutely perfect) as well as Cottle Organics Cucumber. While I was LIVING FOR each dish, my mom is an extremely picky eater so I was skeptical as to if she would enjoy them. However, she tried everything and loved it all. It's a true testiment to how delicious the food is there. Even though we were super full from our small plates, we decided to order entrees as well. The second I saw the "Goomba"-Too Burger, I knew I had to order it! When I lived in Los Angeles, I would go weekly for a while and grab a Goomba burger at Stout Hollywood's happy hour so you can imagine my excitement to try The Bistro's version. Note: the original version of the Bistro's Goomba burger is James Beard award winning! If it's good enough for James Beard, it's good enough for me! Fair warning, this burger is massive. I had to cut it in half and still could barely eat it all. Don't worry, I ate it for breakfast the next morning and it was just as good! 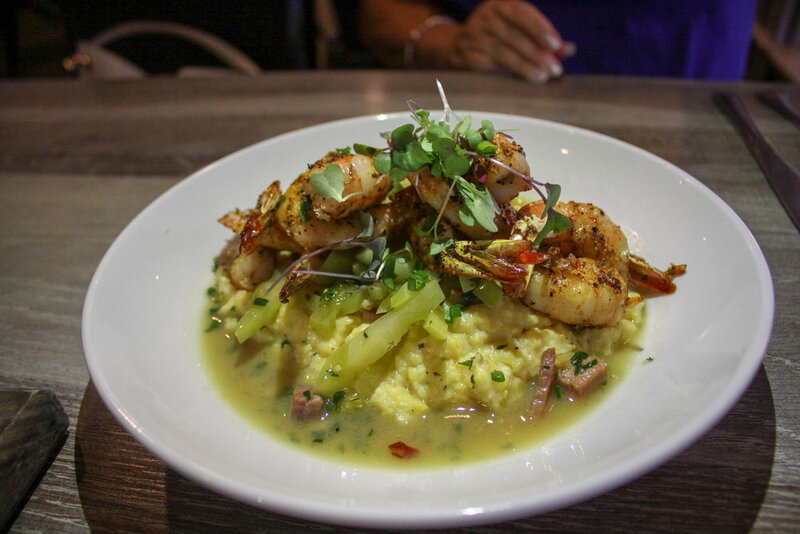 Mom decided on the shrimp and grits which while absolutely phenomenal, pretty hard to eat after all of the small plates! While she was filled to the brim, she did enjoy the few bites she had on the dish before getting it packed up in a to go box. Before we could grab the check and our to-go boxes, the staff insisted that we try their beignet's. I searched deep down in the depths of my soul to make room for these bad boys and I am so glad I did. If I could go to The Bistro only for the Pimento Cheese Dip and beignet's, I would and I would do it every day for forever. That's how freaking good it is! Mom and I thoroughly enjoyed our girls night out at The Bistro as well as the kind staff and Chef Bud Taylor. I can't wait to go back and try their ever-changing menu, as well as their nationally renowned Bourbon menu. Thank you so much Bistro team for the most amazing night! Have you ever visited Topsail Island? What's your favorite eatary?